My family surprised me for my 50th last year with a gift voucher to have our photos done. Well we finaly did it. It was the best present they could have given me, the last ones we had done was when the kids were in primary school and as you can see that was a long time ago. From left Lauren, me, Mark, Jess, Lisa and Stu. I have been feeling guilty about not blogging more regularly but I've never been one to keep a diary or journal; I figure I do this for my own enjoyment so why worry. A lot has happened since my last post. Everything is back to normal after the fires, I have unpacked our evacuation cases and put away all the papers and important bits and pieces I'd been carry around in my car. It's great to be able to relax again. It's been just over four weeks since Creative Soul Retreat but it seems so much longer. I had an absolutely wonderful time, it was so nice to catch up ladies I hadn't seen since previous retreats and to meet others that I had only know online. 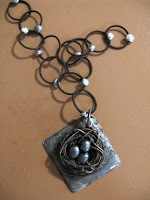 I spent my two days there doing workshops with the lovely Stephanie Lee , it was fantastic. She is a great teacher and we had a lot of fun. Congratulations to Bevlea, she and her helpers did a fantastic job and I can't wait for CSR 2010. 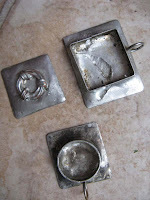 Here's some pictures of what I did in the classes. This is the start of a necklace, still more to do yet. Some bezels, I really enjoyed this but I need to practice a lot more. Marg and I have had a get together since to play around with what we learnt and we do plan to do its on a regular basis so hopefully I will improve. 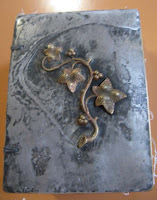 The cover of the soldered book. 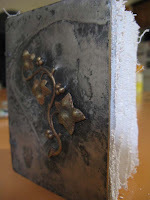 I loved this class, flooding with the solder was great fun and I love the plaster pages; the feel of them and the noise they make when you open and closed the book. I still have to decorate the spine. And here's a pic of what I did with the little houses from the swap. It doesn't show up very well as it's leaning on a wood bench but they are mounted onto an old fence paling. I've added some houses that I've received in other swaps as well. It makes quite a good village I think.